Our "RAU AHA Tonic" is a refreshing toner with mild fruit acids. Mild Alpha Hydroxy Acids (AHA) improve the natural acid protection layer of your skin and accelerates the natural exfoliation process improving the penetration of active ingredients into the skin. Highly recommended prior to every application of a skin care cream, especially for blemished skin. The result is a clear and smooth complexion. Mineral Oil-free, paraben-free and PEG-free. Made in Germany. Apply to face, neck and decollete after cleansing. Please shake well before use. 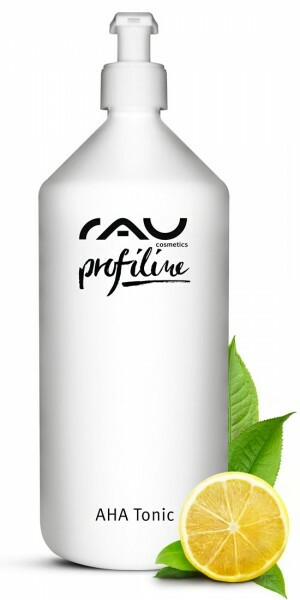 Related links to "RAU AHA Tonic PROFILINE 1000 ml - Refreshing Toner with White Tea"
Customer evaluation for "RAU AHA Tonic PROFILINE 1000 ml - Refreshing Toner with White Tea"